If you shoot in light polluted skies with a DSLR, listen up. I’ve recently got my hands on an affordable new astrophotography filter for my Canon T3i. Whether you shoot with a modified camera through a telescope or a stock DSLR with a camera lens attached, a light pollution filter will help you shoot longer subs. Longer image exposures mean a deeper view on your subject. In the past, I have used light pollution filters such as the Astronomik CLS, and IDAS LPS clip-in models on my Canon DSLR. 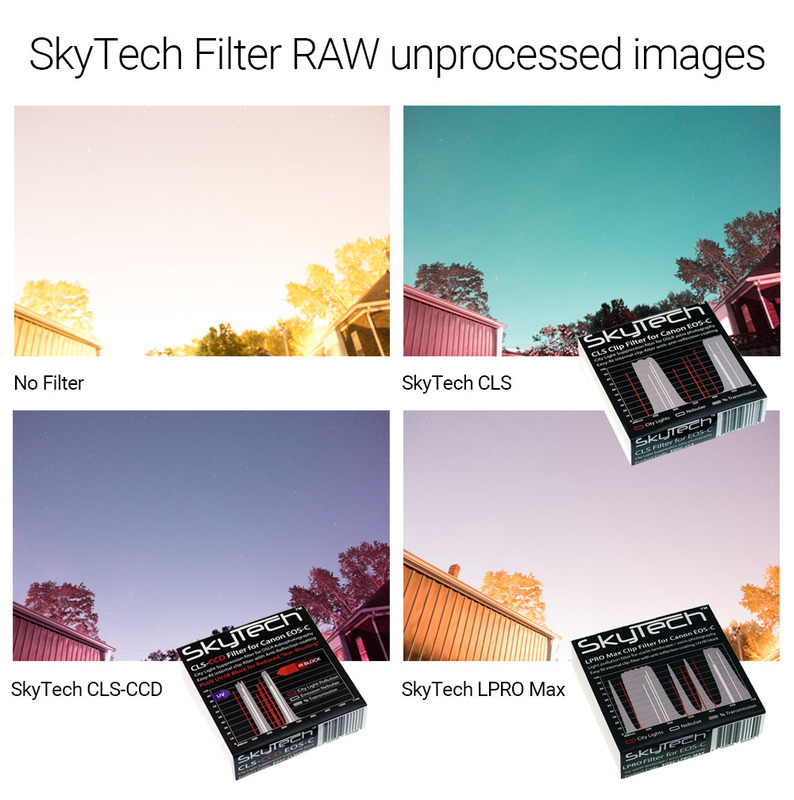 In this review, I will be testing 3 filters from SkyTech that are designed to block out light pollution, and allow you to partake in astrophotography from the city. This review is most valuable to those shooting deep sky astrophotography with a modified DSLR from a light polluted location. If your exposure time is limited to under 2 minutes due to a washed out city sky, I feel your pain. My backyard is considered to be a Class 8 on the Bortle Scale, which is almost as bad as it gets. Images shot in my backyard without a filter on my 600D are completely white after a 120-second sub at ISO 1600. 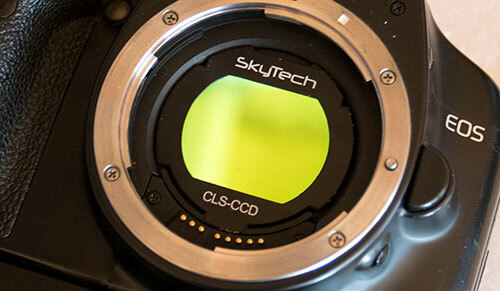 SkyTech offers clip-in filters for Canon EOS DSLR’s in several different imaging situations. Each has their own characteristics to perform best based on your imaging location and conditions. For instance, the LPRO Max filter is designed for wide angle landscape astrophotography and produces more natural looking star colors than traditional UHC or CLS filters. This design lets more overall light in but renders the colors in the Milky Way more accurately. 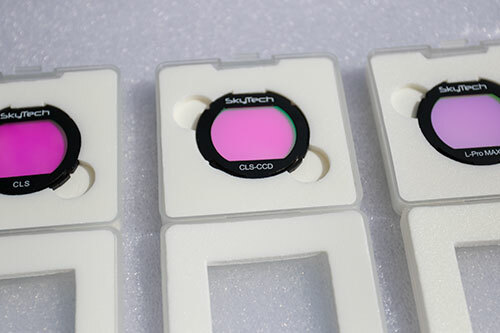 This line of SkyTech LP filters was designed for use with APS-C sized Canon EOS cameras such as the Canon Rebel series. Each SkyTech filter uses polished Schott glass in a precision laser-cut housing. The clip-in design fits securely over the sensor of your Canon camera. The CLS filter was designed with a unmodified DSLR camera in mind. As opposed to a UHC filter, the CLS filter has a wider band-pass to produce more natural colors in your images. This filter is suitable for imagers on the outskirts of town, dealing with moderate levels of light pollution. The CLS-CCD filter improves the visibility of deep sky objects while blocking out a great deal of city glow. This version is suitable for modified DSLRs because of the built-in UV/IR block filter. This produces smaller, sharper stars. This version has a finely tuned band-pass that blocks light pollution while allowing a very natural star colors to pass through. This results in a more natural-looking Milky Way, and the best option for wide angle nightscape shooters. At the end of the day, you’re going to have to make the call on which astrophotography filter is best for your unique imaging situation. These clip-in filters were graciously sent to me from Ontario Telescope and Accessories. 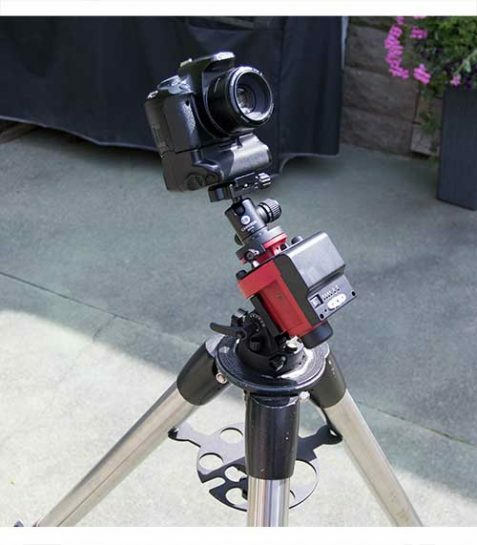 If you live in North America, I highly recommend checking out their growing list of products to support backyard astrophotographers such as myself. In the video below you will see actual results using the CLS-CCD filter using my DSLR and telescope. 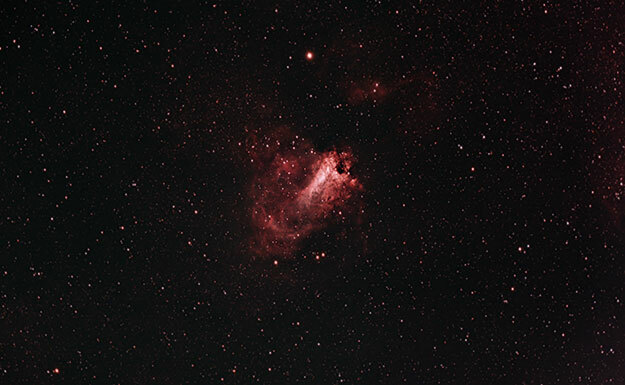 The imaging target is the Omega Nebula, which was shot on May 30th using data captured through the SkyTech filter. Many DSLR astrophotography enthusiasts live in areas away from large cities, or perhaps on an island where vast views over a large body of water are available. Others (like myself) are not so lucky. If we want to make this hobby work, we need to get creative. I live in a medium-sized city in Southern Ontario. 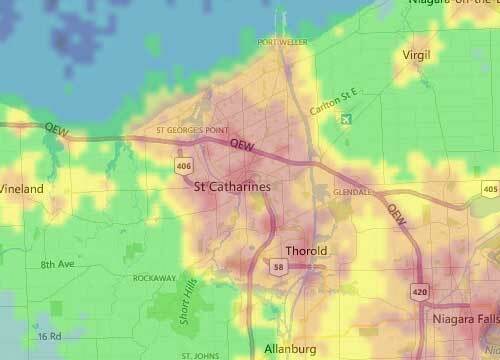 Light Pollution from Niagara Falls is to my East, and Toronto to the North. To make matters worse, I live almost directly in the center of town. This all contributes to a washed out night sky full of street lamp glow and more. Just have a look at the single exposure above without using a filter on my DSLR camera. Pretty scary, isn’t it? Despite these shortcomings, I continue to execute deep-sky images through my telescope month after month. Filters, such as the SkyTech CLS-CCD Clip-in filter make this possible. Don’t believe me? Using the filter on my DSLR allows me to capture exactly what I am missing up there. The intense glow of the city can still be seen creeping into the Milky Way, but the light pollution filter has revealed the wondrous starry sky beneath the curtain of light. 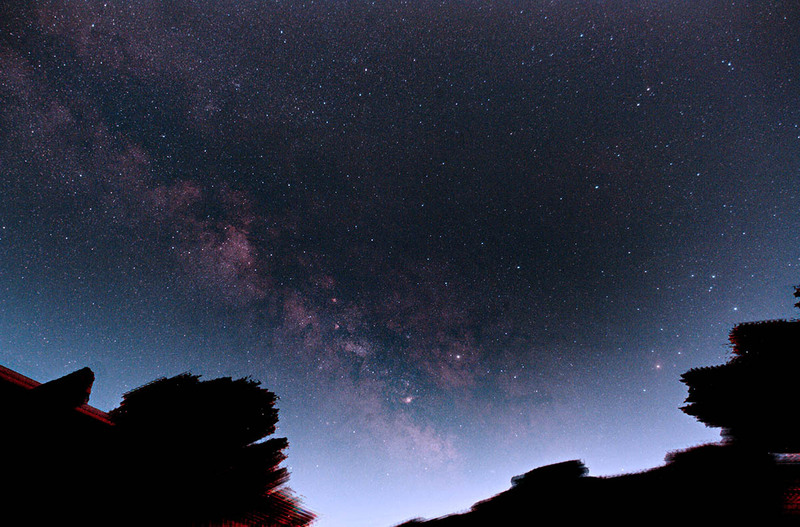 The photo above is a stacked composite of 11 images shot using the SkyTech CLS-CCD filter, and a wide angle camera lens. Like many of you, I am very interested in anything that can help me partake in astrophotography from the comfort of my own backyard. Even with the use of a light pollution filter, we must then bring the final stacked image into Photoshop for image processing. Adjusting the levels and setting the black point finally reveal the deep sky wonders in the photo, and obliterate the ugly glow of a washed out night sky. My backyard is classified as a red-zone on the light pollution map, which is the second worst amount of LP possible. So, your images may look better or worse depending on the amount of light pollution you deal with. These photos were captured using a Canon 7D Mark II DSLR with an EF 17-40mm f/4L USM Lens. The ISO was set to 6400, and each exposure was 30-seconds long. The cameras white balance was set to auto, as these RAW images will be adjusted in post processing. 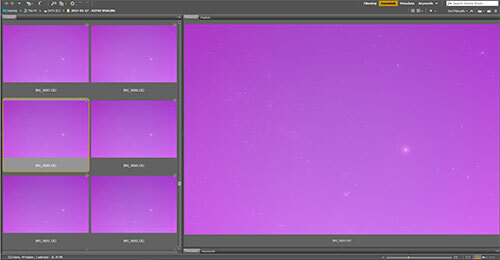 As you can see, very few (if any) stars can be seen in the RAW image frames. However, the amount of overall light filtered is evident. As expected, the LPRO Max filter from SkyTech lets the widest array of light wavelengths through, to capture the true color of the landscape, while keeping light pollution at bay. The LPRO max filter would be best used in a rural environment with a pleasing landscape, rather than a backyard in the city. In late 2018 I reviewed the Optolong L-Pro broadband filter. Just like the LPRO max filter from SkyTech, it’s goal is to create images with natural looking colors. Using more conservative camera settings (ISO 800) for 30-seconds, I was able to produce some impressive images from my backyard. This is a good choice if you’re planning on shooting broad-spectrum targets such as galaxies or reflection nebulae. The Pleiades star cluster turned out especially good using this filter and a stock Canon 5D Mark II DSLR camera. 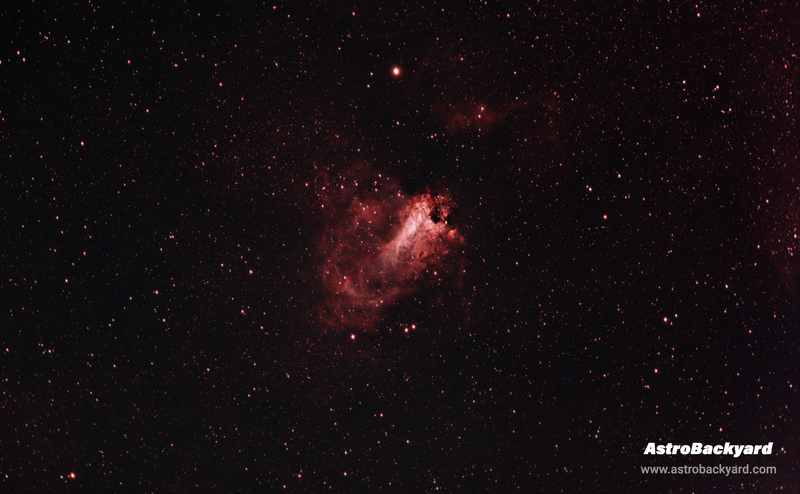 In case you didn’t watch the video, here is the Omega Nebula I captured using the SkyTech CLS-CCD filter in my Canon 600D. The raw data actually looked better than what I was getting with my previous IDAS LPS filter in terms of contrast in the deep sky object. 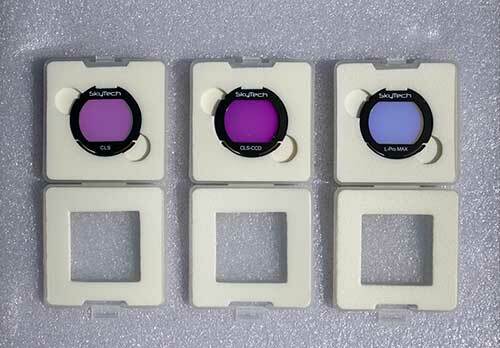 The IDAS LPS Filter does edge out the SkyTech CLS-CCD in terms of natural sky and star color, but at the cost of less contrast. The LPRO Max and CLS filters offer a wider band-pass for more natural looking stars. I’ll discuss my way around this below. As you can see, an impressive amount of light from the deep sky object was able to be recorded through the light pollution. Also, the stars are small and sharp due to the UV/IR qualities of the SkyTech CLS-CCD filter. The transmission graph above shows exactly where the CLS-CCD filter excels – Emission Nebulae from the city. The Canon 600D was attached to my Explore Scientific ED102 Telescope with an Altair Lightwave 0.8 Field Flattener installed. The focal length of my ED 102 is perfect for capturing wide field views of the nebulae in Sagittarius. Related: Recommended Astrophotography Telescopes. The star color and background sky are a little on the red side, so that will need to be corrected by shooting subs using a filter with a wider band-pass. There are a few options here, including shooting a number of image frames using the LPRO Max filter, or IDAS. These images can then be combined in Photoshop to create a composite with both the intense deep sky details and natural sky and star color. 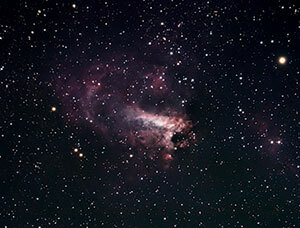 The photo on the left is an old version of the Omega Nebula using the IDAS LPS filter. This shows how the star color is more natural, but less detail was captured in the nebula. See the composite version of both data sets. For a breakdown of the steps used to process this image, have a look at my recent deep sky image processing tutorial. By now you should have an idea of how much light these filters let in, and how the CLS-CCD filter performs on deep sky objects. But what about a wide angle shot using a DSLR and camera lens attached to a tracking mount? 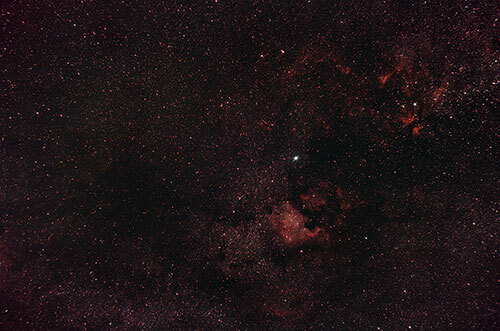 On May 30th I mounted my Canon 450D to an iOptron SkyGuider pro for a wide field look at the constellation Cygnus. I’ll cover the amazing iOptron SkyGuider Pro in a future video and post (spoiler – I LOVE it). Below you can see the configuration used for the photos I am about to share. The combination of a modified DSLR such as the 450D with a 50mm camera lens attached offers some tempting photography possibilities. The 50mm lens I use is lightweight and affordable. Best of all, it fits nicely over any clip-in astrophotography filter you choose to use on your DSLR. 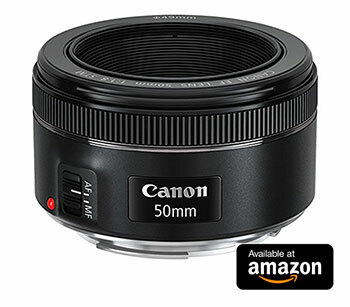 At a fixed 50mm focal length, the Canon EF f/1.8 STM Lens fits multiple deep-sky objects in one shot. This is especially effective in capturing the nebulae in Milky Way with your modified DSLR. 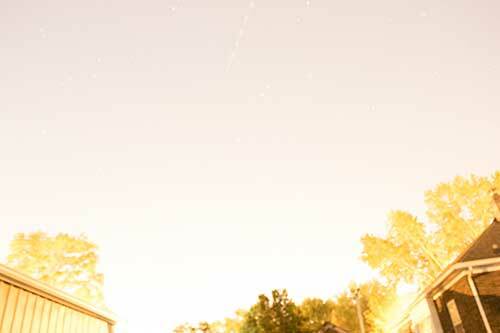 The photo above is a stack of 24 x 90-second exposures at ISO 800. The camera lens used was a Canon EF 50mm f/1.8 lens (Shot at f/2.8) This photo was captured through extremely heavy light pollution using the SkyTech CLS filter in the DSLR. A 90-second exposure of this area of te sky without a filter would be completely white! Here is the RAW image data collected using the SkyTech CLS-CCD filter on through a 50mm Camera Lens. These 90-Second exposures were then stacked in deep sky stacker with no darks, flats or bias frames. Due to the extreme light pollution from my backyard, I’ve decided to create a greyscale version of my image. This way, you can see the detail acquired in the Milky Way without the nasty impurities in the background sky color. Shots like this get me really excited. How many Deep sky objects in the Milky Way can you count? 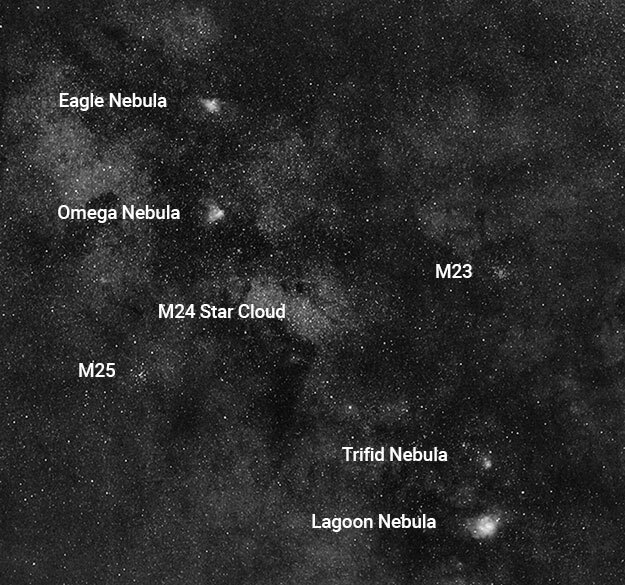 The Omega Nebula, Eagle Nebula, and Lagoon jump out at me, but there are many more in there. That is the magic of a light pollution filter. Imagine what you could accomplish in moderately light polluted skies? To cut through all of the city glow to reveal these objects in space is truly remarkable. No longer do amateur astrophotographers need to travel great distances to photograph space. It’s all available to you in your backyard, and this is proof. If you are an amateur astrophotographer in the city, a light pollution filter such as the SkyTech CLS will open new doors to your DSLR astrophotography. Whether you shoot with a stock or modified camera, these Canon clip-in filters will block plenty of unwanted light. Who are these filters suitable for? Those of you who shoot Milky Way panoramics using a wide angle camera lens will benefit from the LPRO Max filter with its natural sky and star color qualities. I don’t recommend trying to create a wide-angle Milky Way portrait from your suburban backyard, save that for a camping trip or trip to darker skies. While it is exciting to see the Milky Way from a city location, taming the overwhelming glow in post-processing can be a pain. For me, a 20-minute drive out of town with the iOptron SkyGuider pro would make more sense. Which filter do you recommend most? I have tested these filters both through a telescope and with a camera lens, and my results were impressive. The SkyTech CLS-CCD is the best option for modified DSLR deep sky astrophotography. 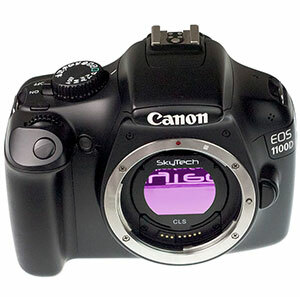 If you shoot DSLR deep sky astrophotography with a modified Canon camera, the SkyTech CLS-CCD is a must. It performs as well (if not better) than my existing IDAS Light Pollution Suppression filter in terms of pure light pollution blocking power, and costs much less. The LPRO Max is an interesting option for those who wish to create starry landscape images of the Milky Way. It lets enough natural light pass through to the sensor for natural colors, with the added benefit of reducing city glow. The CLS filter is the most affordable option and is comparable to the Astronomik CLS. This version is an excellent option for astrophotography with a stock DSLR. 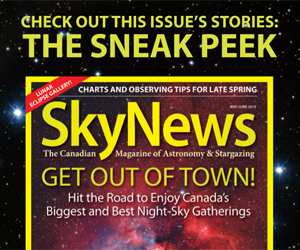 For detailed information on the astrophotography filters from SkyTech, visit Ontario Telescope and Accessories. I hope you have found this resource useful in your on-going passion for capturing the night sky. For the latest information and tips, please follow AstroBackyard on Facebook. I would like to buy a cls filter. I use an Eos 60da camera. Wich one would you recommend? Hi Jaap, I would suggest the Astronomik CLS EOS clip filter – or the IDAS LPS clip filter from Hutech for your DSLR. I have used both and they are excellent. The IDAS seems to outperform the Astronomik but is more expensive. You’ll have to see who will ship those products to your location, of course. Clear skies! Do you find that when using the Astronomik CLS filter, the images are overly red? I’m thinking of purchasing one, but have noticed some pictures are like that. Interesting article, my question is which filter would be best suited for an unmodified Canon 77D APS-C sensor. Using EF lenses. Current lenses I have are EF 50mm f/1.8, EF 10-18mm f/4.5-5.6 IS, and EF 70-200 f/4 IS. I live in Southern California and as you can imagine light pollution is heavy, but I do travel to Nevada alot and shooting in the desert would prove to be much better for reduced light pollution. I will be using lenses over telescopes for the moment. Hi Myke – The clip-in filters are excellent for use with various Canon EF lenses. So far I had sucesss using the 50mm f/1.8 and 300mm F/4L with the Skytech filters. For you situation I would suggest the SkyTech L-Pro version as it renders the best colors for starscapes. It is the most expensive – but it doesn’t create the harsh filtering needed for deep-sky close ups in the city. That’s what I’d go for. You should also look into the Astronomik CLS. Clear skies! Thank You Trevor, one last question. Are these strictly for APS-C? Or will they fit in a Full Frame DSLR too? If not are there similar filters for FF? These SkyTech models are just for APS-C bodies. There are some options available for full frame cameras on the market (I know that Optolong makes some) Clear skies! Hey man, I just stumbled on your youtube channel and wanted to say thank you, I’ve just recently been interested in astrophotography and I live in Toronto and find your videos very helpful/relatable. I was sorry to see about your father, I give you my condolences. 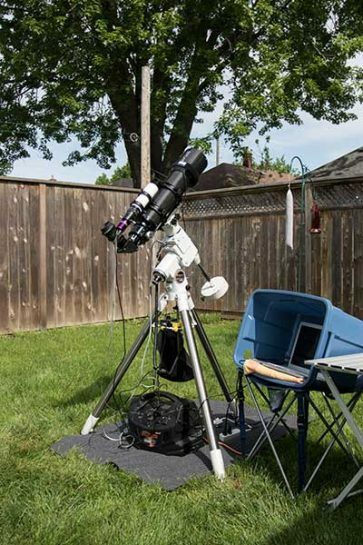 I got a Celestron 6SE as a gift, at the time I was living in Sudbury.. (darker skies) I just ordered my T-ring setup and it should be in Tuesday I am currently using my old Canon Rebel T1i and will upgrade with time to something better. If you have any pointer for my setup I’d love to hear from you. Thanks Josh (neighbour!) I hope your t-ring and adapter ring came in by now. Did you try it out? I believe the Nexstar 6SE is an Alt-Az mount – meaning long exposure deep-sky astrophotography will be tough. There are some guys making it work with some custom engineering. An equatorial mount is best – and I usually suggest the Orion Sirius EQ-G on a budget: http://amzn.to/2xHx5HC – But this means either mounting your 6SE tube to this or getting a new scope. Quite the adventure you are about to take on – and I hope you do! Can I benefit using a modified DSLR with lenses versus an unmodded DSLR? After looking at Astro Modifications Astro’s website and see he actually has a T3i full spectrum for sale, was kind of interested. Yes, you can benefit from a modded DSLR with a camera lens attached! 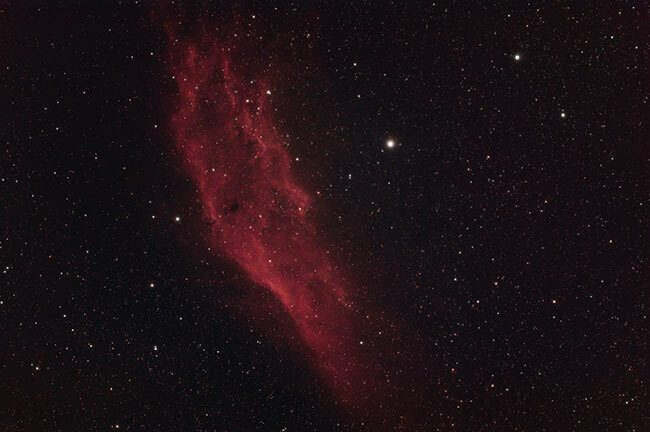 If you are shooting deep sky objects (Especially emission nebulae) – You’ll see a big improvement with a modified cam. (Even in wide angle shots eg. 18mm) Some of the huge nebulae like Barnard’s loop are almost invisible without a mod! I’m a bit confused. In your article you conclude the SkyTech CLS-CCD is the best for modified cameras, but Jaap Spigt ask you for a recommendation with his Canon 60Da – specifically made for Astrophotography, so I assume same as a modified camera, you recommend the CLS EOS clip filter, a filter for NON-modified cameras. Can you explain the dependency? HI James. 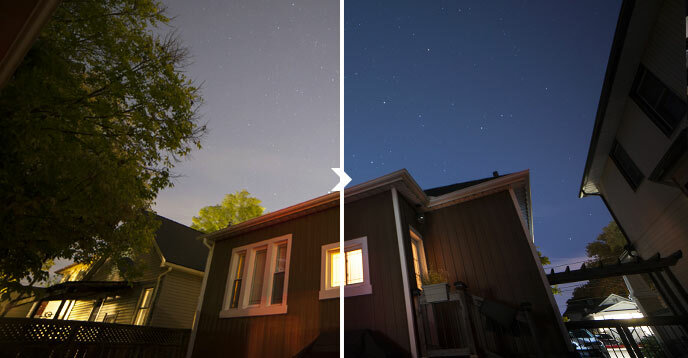 I’ve learned a lot more about clip-in DSLR light pollution filters since then. 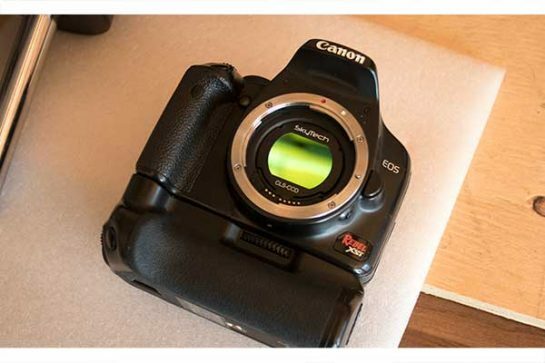 Now – I’d recommend a CLS-CCD filter for a 60Da. I think the Astronomik CLS will work well for Jaap too, especially compared to unfiltered shots in LP. With that being said, the transmission graph for the CLS-CCD shows that this filter is a better choice with the “modified” 60Da. That’s the problem with giving advice when you are still learning yourself, it’s not always the best. I have been really enjoying your YouTube videos. I am just getting into Astrophotography, and don’t have a modified DSLR yet. While I am deciding on which path to take (dedicated CCD or modified DSLR) I have been considering putting a filter inline to help eliminate some of the more troublesome light pollution from my suburban area. I am a bit confused about something. In this article you review the SkyTech filter line and include a fine pictue using the CLS filter, but when asked to make a recommendation you said Astronomik CLS filter. Is there something I am missing? First of all thanks a lot for all the info you are sharing (My wife hates since I started to follow your YT channel :P, the list of gear to buy has grow up). I own an Optolong UHC filter which has gaving me lots of good results but, when I try to use it for wide angle landscapes pointing at cities, I am really struggling to get good results. My objetive at the moment is to get some long exposure of cities with cars moving with that type of effects and supresing the light pollution without affeting too much the natural colors… Which filter would you recommend?? I am just a beginner into Astrophotography. What Recommendations Can you give me beside my 2 questions above? You could mount your 100-400mm lens on there for some long exposure imaging. Lots of options and decisions to make from here man. Hello Trevor, I recently decided to pick up astrophotography as a hobby and bought a Canon 450D baader modified. I also live in a red LP area, and would like some advice. What filter should I get? If you could give me some pointers on what kind of lenses I may need to purchase I would appreciate that as well since I am new to photography. Want to get in lots of practice before I go to the dark sky reserve in Idaho to see the perseids. For now I’ll be taking wide pictures if the milky way and constellations I think since I don’t own a telescope yet (want some experience with the camera first). Sorry for the long post. Living in the city of Dallas, I am also in the red zone and the closest non-red zone is basically an hour at minimum away. I have a Canon 6Ti. Would you recommend the following clip-filter? If not, what would you recommend for my camera? Hey! Yes that Astronomik CLS Clip-Filter will certainly help a lot from your red zone. You should see a big difference in the length of exposures you can take without totally washing out the sky. It sounds like your camera is not modified, so the CLS (Not CLS-CCD) is what you want. Your camera still has the stock UV/IR filter in place – so no need to add another one in front. All the best man. have you heard about any good filters for Nikon cameras? Specifically for D7200. I’ve done a little research already but if I would like to hear an opinion from anyone then I’ll put my bet on you, bro. Stumbled on your youtube channel while looking for some astrophotography tutorials…only shot milky ways before but you got me addicted to astrophotgraphy. Thanks for the article, as many others I’m still a little confused. I have a Unmodified EOS 450D and a full spectrum modified 550D. I was thinking that the reason for modding was to allow more IR on to the sensor and the CLS-CCD clips more IR than the CLS. So my question is why go with the CLS-CCD over the CLS for modded cameras? Andy – I totally understand your confusion. (I thought the same thing). 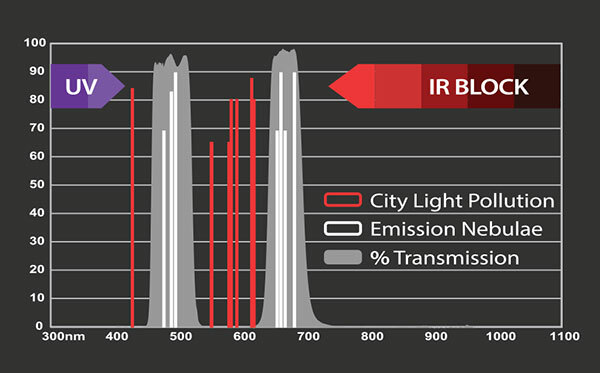 To simplify the answer – the IR cut in the CLS-CCD allows the “Good” IR light to come through, not the bad. It helps reduce star bloat while allowing the reds you DO want in emission nebulae to pass through.